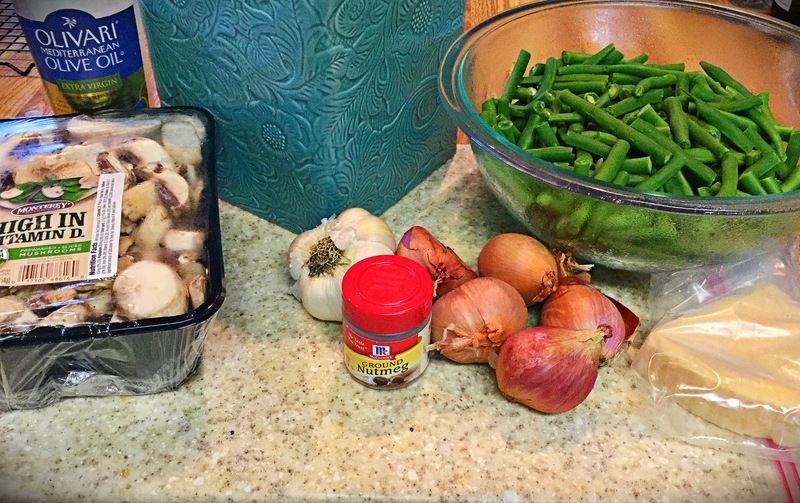 You may be thinking..why go through all the effort when the Campbell’s soup Green Bean Casserole recipe has been around for decades?? Well, because THIS is the best, that’s why! I luckily stumbled upon this goodie years back and just tweaked a couple of things to suit my family. There’s no going back to the dark side now! 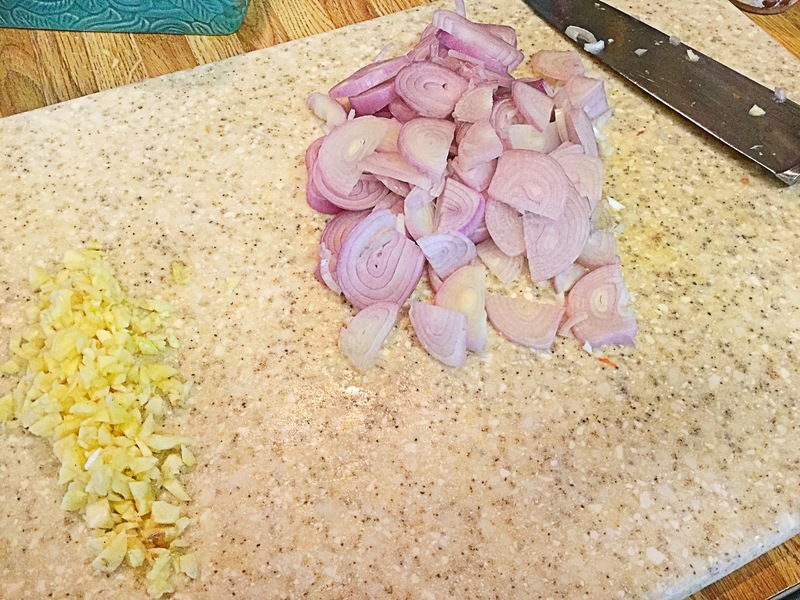 ..Well, maybe occasionally, it does remind me of good memories growing up 🙂 Anyway… Now besides what you may be thinking is a lot of work, this can all be done in an hour and it’s ALL fresh!! You actually KNOW what your family is consuming. That’s kind of awesome. Preheat the oven to 375 degrees and spray a 2-quart baking dish with non-stick spray. 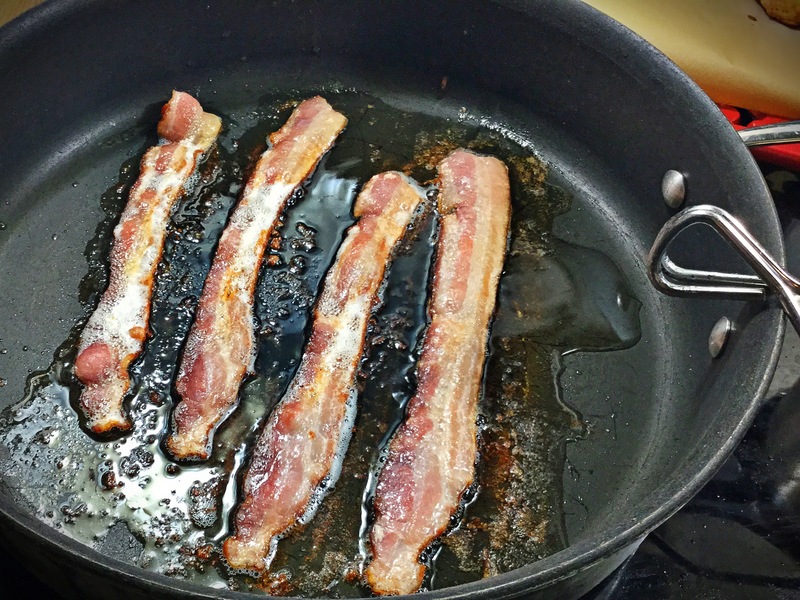 In a large deep skillet, cook the bacon strips till desired doneness and set aside on a paper towel lined plate. Then add the extra virgin olive oil straight into the excess bacon grease and heat till almost smoking. 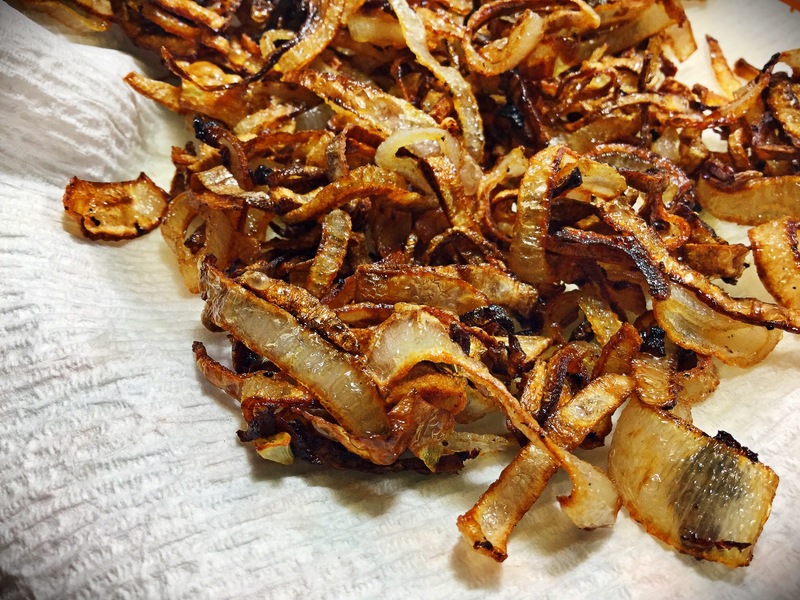 To the hot grease/oil, add in the sliced shallots (about 1/4 cup at a time, it took about 3 batches) and fry until they turn a nice golden brown and and crisp up. Once done transfer to another paper towel lined plate and set aside. 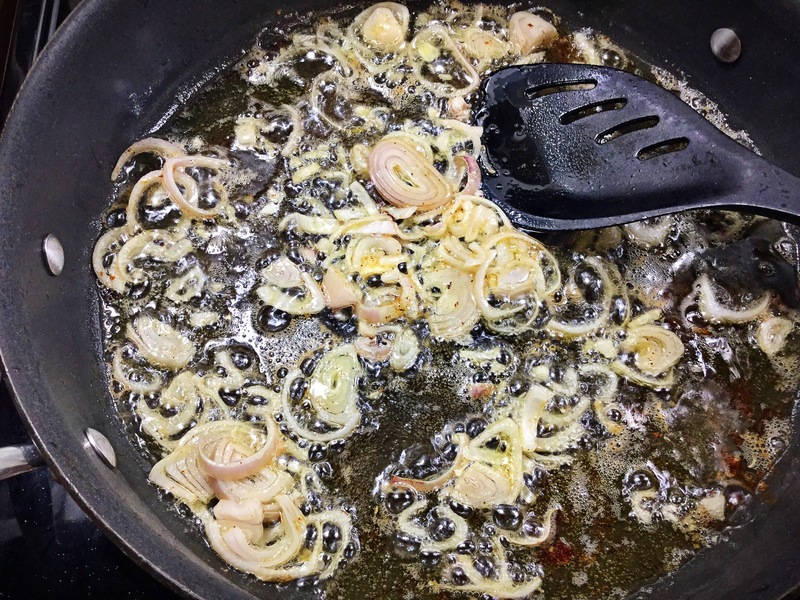 Now that the shallots are done frying up, dispose of the excess grease/oil EXCEPT for roughly 2 Tbsp’s worth. 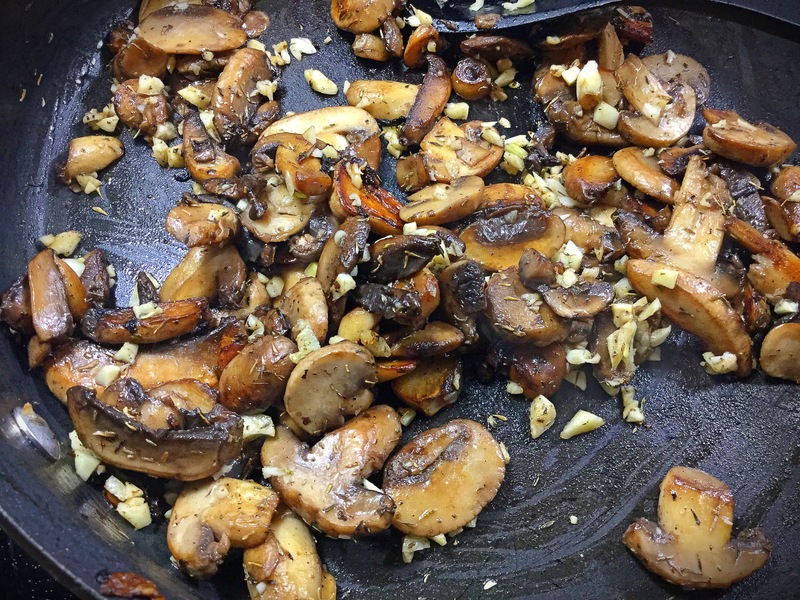 You will now add all of the mushrooms to the grease over a medium-high heat. Stirring occasionally, the mushrooms will start to ‘sweat’ and release their moisture. Keep cooking until all of the liquid is evaporated, about 10 minutes. 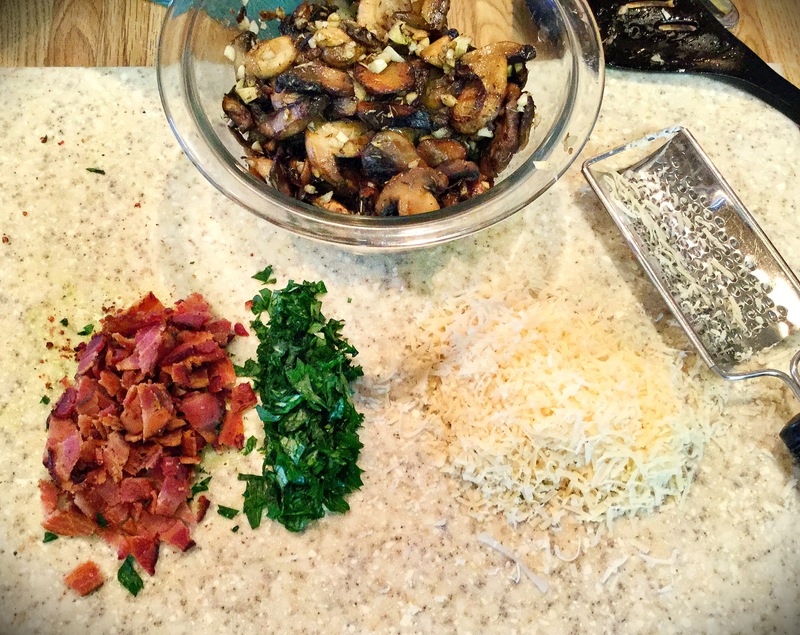 Finally you will add in the minced garlic and thyme leaves. 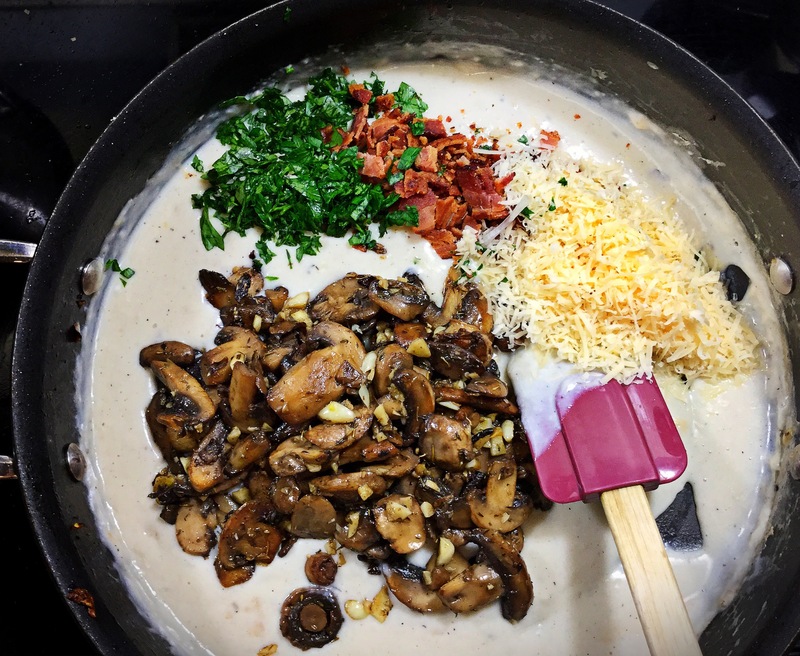 Cook for 30-60 seconds and transfer the mushroom mix to a bowl, set aside. 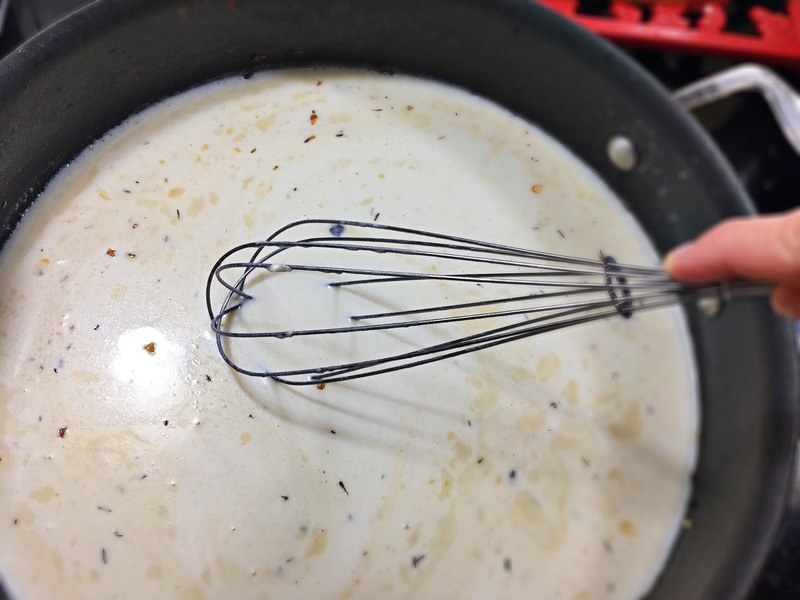 While the mushrooms are cooking down, whisk together the flour and milk in a bowl until the flour is dissolved. 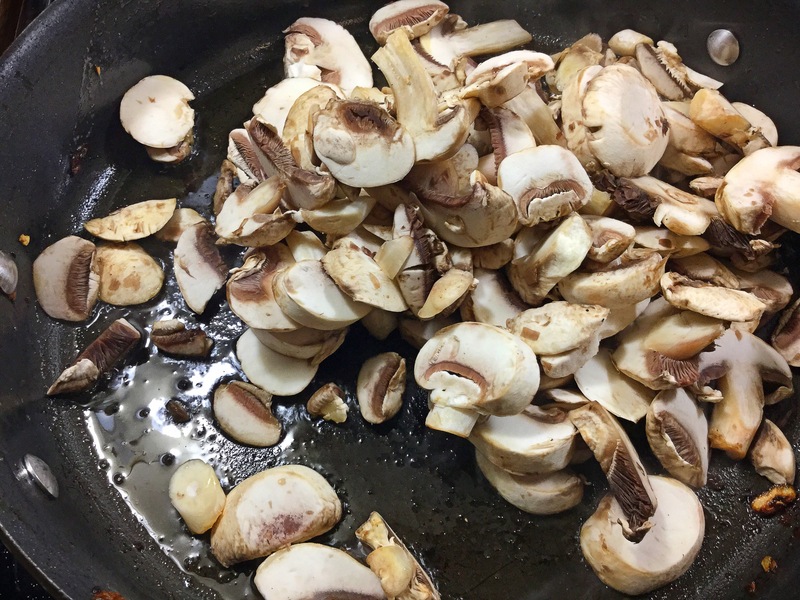 Now add this right to the same skillet (you’ve been cooking everything in/mushrooms just removed from) while constantly whisking and bring to a simmer. 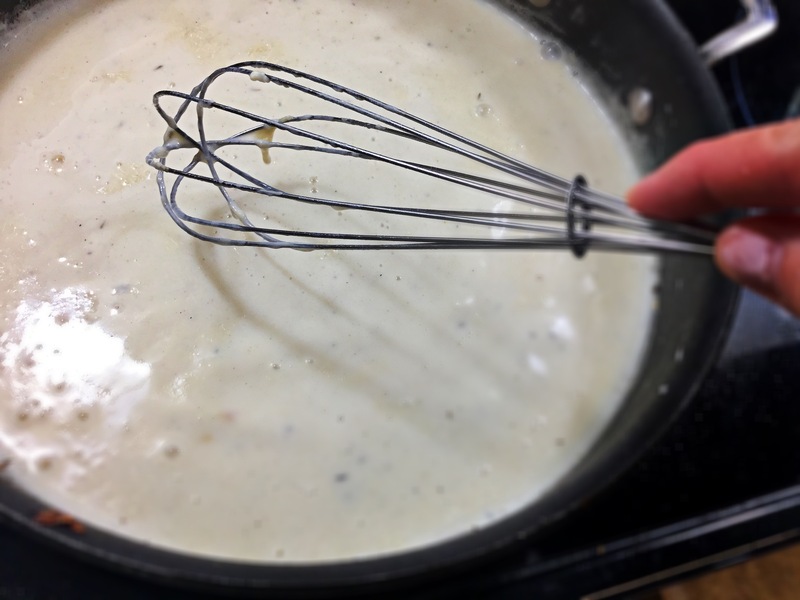 Lower the heat to medium-low, whisking occasionally, and in about 10 minutes it will reduce down and thicken up nicely. *should ‘coat’ the back of a spoon. Remove the skillet from heat. 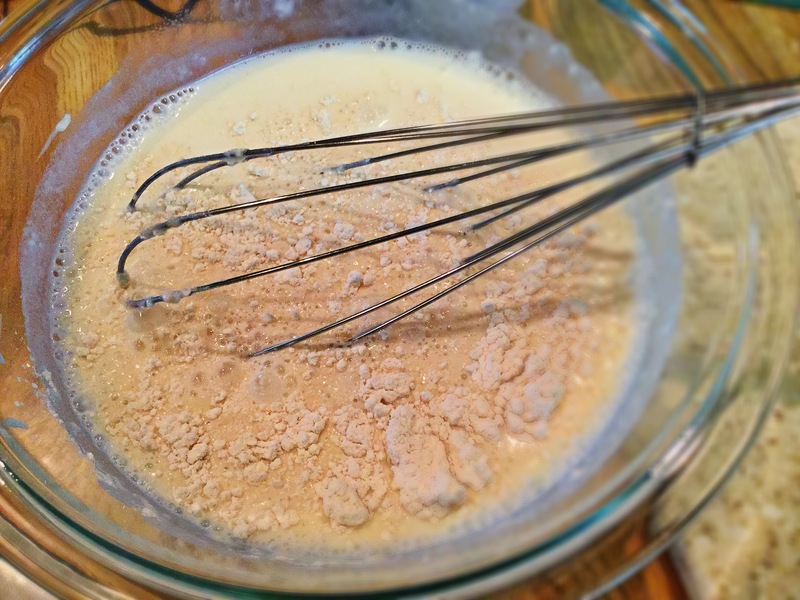 See how it’s starting to ‘coat’ the whisk and reduce down? Ok, here is the real easy part! 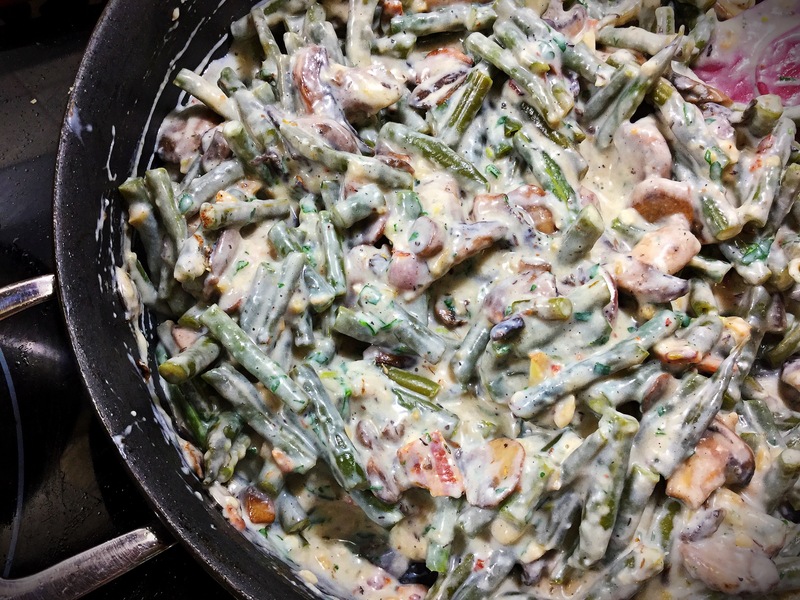 Now is when you can fold in the mushroom mix, 1/3 cup of the parmesan cheese, the cooked and chopped bacon, parsely, nutmeg, salt & pepper and the GREEN BEANS to that milk/flour rue you just made. Resist the urge to spoon in mouth…though I’m 100% guilty! 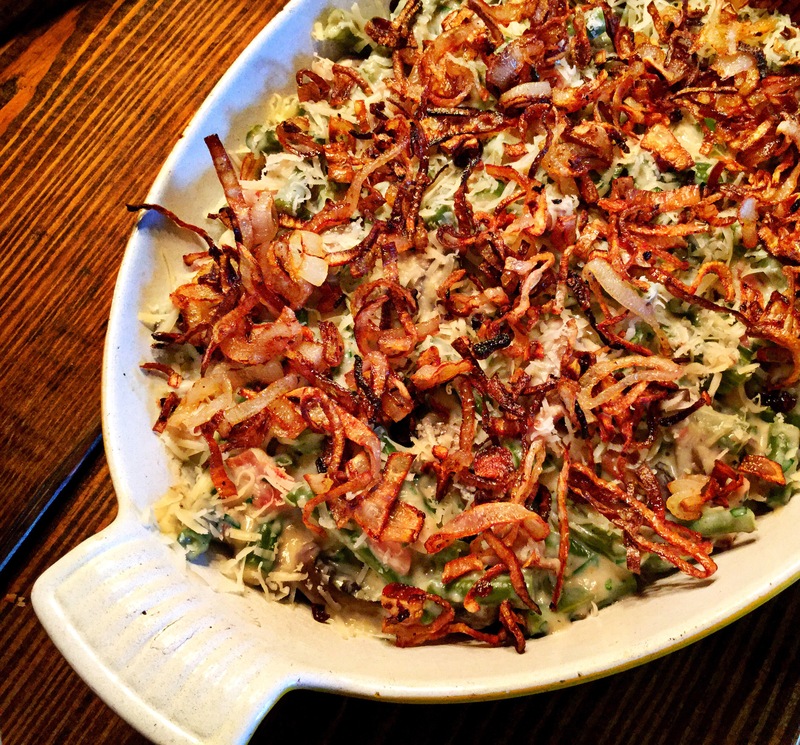 Pour this holiday staple side dish straight into the non-stick coated casserole dish and top with the remaining 1/3 cup of parmesan cheese and the fried shallots you made earlier. Pop into the preheated oven and bake (uncovered) for 20-30 minutes!